Sam-mon. Long a. Not Sal-mon. For the Tsai / Wang New Year’s potluck dinner celebration, I made a salmon dish taken from the Food & Wine Annual Cookbook: An Entire year of Recipes (2007). Yes, I’m about 5 years behind on my cookbooks. The dish turned out to be a hit and super easy to make. Who knew you could cook salmon in 5 minutes just by broiling it?! I don’t think I’m ever going back to baking salmon. Preheat the broiler. 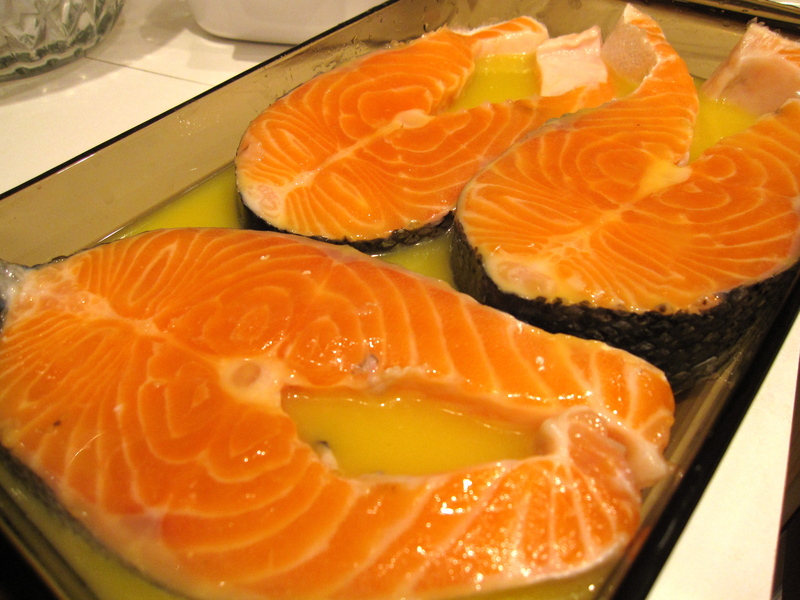 Lay the fish in a baking dish and pour the orange juice over it. [Apparently, if you soak the salmon in orange juice before you broil it, it’ll produce a deep caramelized glaze. This sorta happened?] Season the salmon with salt; let stand 5 minutes. Turn and let stand for 5 minutes more. In a large skillet, melt 3 tablespoons of butter. Add the garlic and cook over medium-high heat until fragrant. Add the mushrooms; season with S&P. Cover and cook over medium-high until the mushrooms have released their liquid, 5 minutes. Stir in the green onions and cook uncovered for 3 minutes. Add the wine; boil for 1 minute. Add the stock and cream and simmer for 3 minutes. Mix the cornstarch and water in a separate bowl. Stir into mixture until sauce thickens. While the sauce simmers, transfer the salmon steak to a rimmed baking sheet. 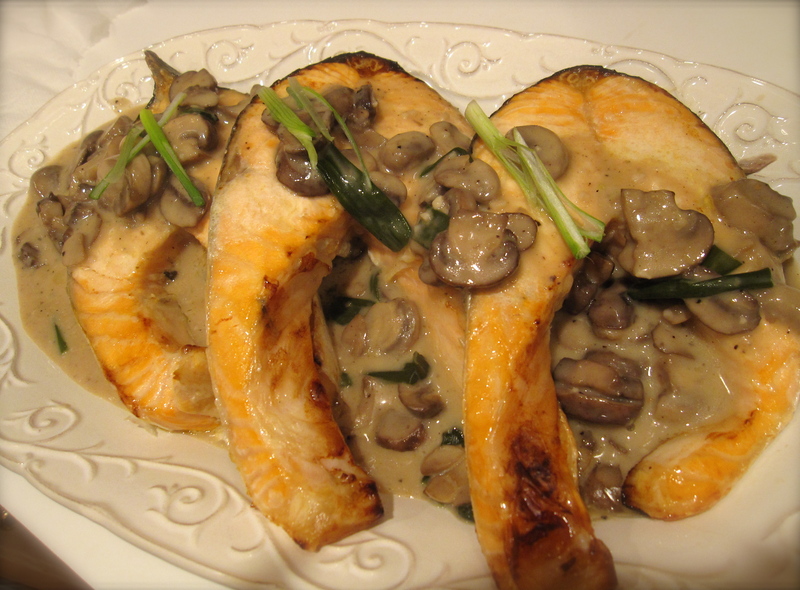 Cut the remaining 1 tablespoon of butter into thirds and top over each salmon steak. Broil 5 inches from the heat for 5 minutes, without turning, until browned and just cooked. Spoon the sauce on plates, set the fish on top and serve. I’m not sure if it was because of the orange juice, the broiling, super fresh salmon, or a combination of all three, but the salmon was probably the best salmon I’ve made. And that says a lot because I’m usually not a huge fan of salmon. But this salmon was super flaky, tender, and not overcooked at all. Yayyy.